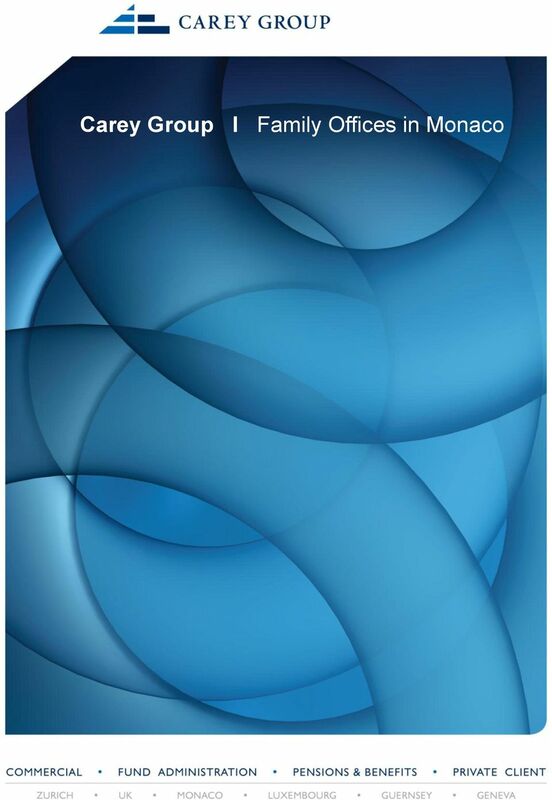 Download "Carey Group l Family Offices in Monaco"
2 Family Offices in Monaco Over the past few years, more wealthy individuals and families have been setting up their own private Family Office or joining Multi-Family Offices. The concept took off in the US, but is now firmly settled in Europe where London, Monaco and Switzerland are favoured locations. It has been estimated recently that more than 300 single Family Offices have been set up in London alone (for families with assets of more than GBP100 million) as well as more than 100 Multi-Family Offices. We estimate there are 40 private offices in Monaco. As the number of wealthy families is on the increase, this trend is likely to continue as families aim to employ expertise in-house or pool resources between themselves. There are a number of criteria that a family considers when selecting a particular jurisdiction including whether there is a beneficial tax regime, good local talent to hire, quality professional expertise investment, legal, trust, tax available locally and the quality of life. If the family will live in the jurisdiction, privacy and safety is also very important. For these reasons and more, many wealthy individuals and families have selected Monaco as a base for their private office. Briefly about Monaco The Principality of Monaco is home to some 35,000 residents, the vast majority of whom are not Monegasque. A good Mediterranean climate, strong pool of professionals and zero personal income tax rates are only part of the attraction. It is well located in the centre of Europe with good international connections, has unparalleled security with the highest police per population ratio in the world, excellent schools and a high quality lifestyle with a strong cultural focus. Monaco therefore meets many of the criteria that international individuals and families seek when selecting their base of operations. What is a Family Office? A single Family Office manages the affairs and/or assets of a single family including the financial investments, private physical assets, trust and corporate structures set up by the family for wealth protection and succession planning purposes. Family Offices do not provide services to third parties. So while it is often desirable for the family to create a corporate entity for reasons of limited liability, asset protection and privacy, these entities do not hold the same inherent risks as those of commercial trading companies. 3 Types of entity in Monaco Entities set up in Monaco will be for either business purposes (commercial) or civil purposes (non-commercial). The commercial entities that can be set up are: General Partnership (SNC) Limited Partnership (SCS) Limited Liability Company (SARL) Limited Company (SAM) commercial or civil objects are available Limited Partnership with shares (SCS) Administrative Offices pay tax at 2.66% of operating costs administrative and financial management for a group no activity except for group administration is permitted All companies authorised in Monaco require a presence in the Principality, whether or not the company is formed with commercial or non-commercial (civil) objectives. An individual or family can also form "civil" companies (Société Civile) that are non trading in order to hold assets as part of their international structuring. Monaco does not require financial statements to be filed publicly, a great advantage to maintaining privacy. Certain entities do not require an audit. Benefits of a Family Office A Family Office enables management of both the family's private and business interests in one location. It also facilitates the separation of private family affairs from the family's business interests, important in managing conflicts of interest that can occur such as between a shareholding family and the CEO of the family's underlying business. It will also help the family define their cultural values, important when significance and reputation rather than networth become overriding factors. For larger families, especially those with new generations coming through, the office will administer family governance structures introduced to bring order and certainty into how the family conducts itself internally and with the outside world. 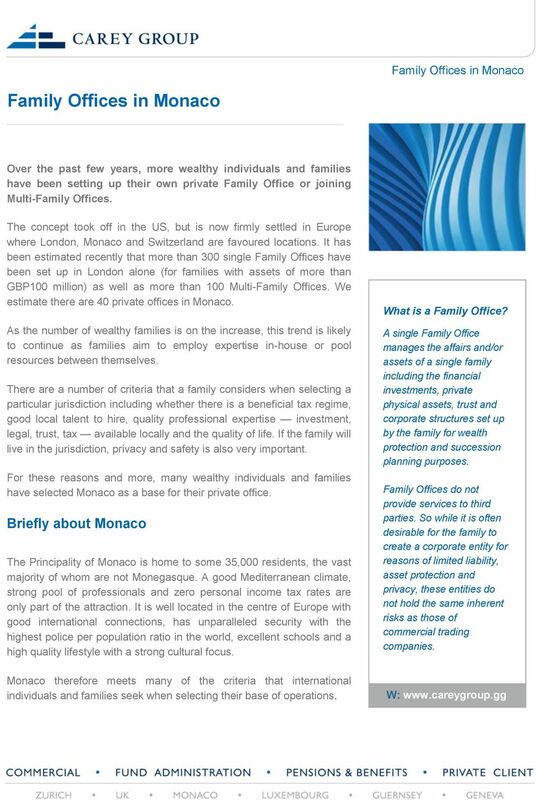 4 Family Office entities in Monaco Once a family has decided to set up its Family Office in Monaco, the question then is what the best entity might be. Invariably, assets will be diversified over a number of jurisdictions and asset classes, from an underlying business to private properties in several jurisdictions, portfolios with different banks and investment houses, artwork, with perhaps an aircraft or yacht. 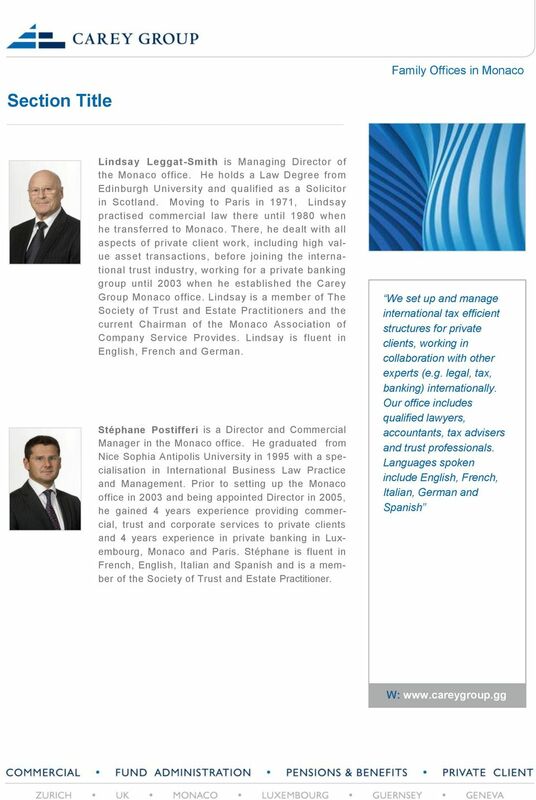 The entity set up in Monaco will be part of or overseeing an international network of trusts, foundations and/or corporate entities which are set up for asset protection, succession planning and tax planning. Where the Monegasque entity fits into the structure will partly determine which entity is best suited. Private activity including the management of personal or family assets requires no authority from the government. So if a family member intends to be resident in Monaco, a company need not necessarily be formed although in practice one is often used to employ staff or hold local assets. If a family member is not resident in Monaco, then a Monegasque corporate entity will be required. 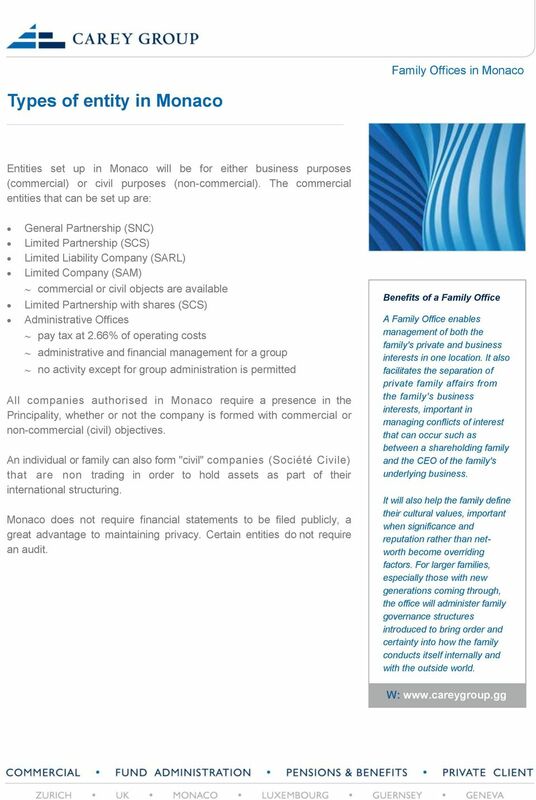 Certain Family Offices in Monaco own fully operating commercial companies, with an ownership structure ultimately held wholly or partly by family members or family trusts. Invariably, assets will be diversified over a number of jurisdictions and asset classes, from an underlying business to private properties in several jurisdictions. 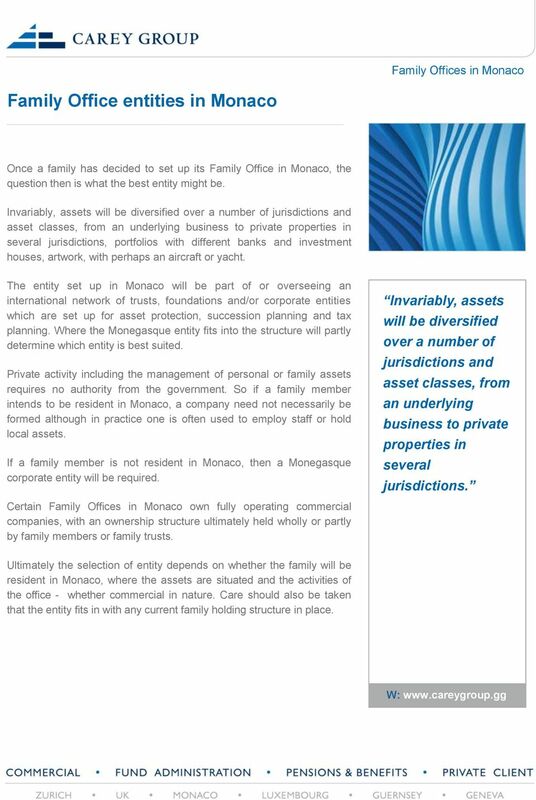 Ultimately the selection of entity depends on whether the family will be resident in Monaco, where the assets are situated and the activities of the office - whether commercial in nature. Care should also be taken that the entity fits in with any current family holding structure in place. 5 Multi-Family Offices in Monaco According to a recent report, Multi-Family Offices account for 85% of the Family Office sector in the US compared with just 45% in Europe. 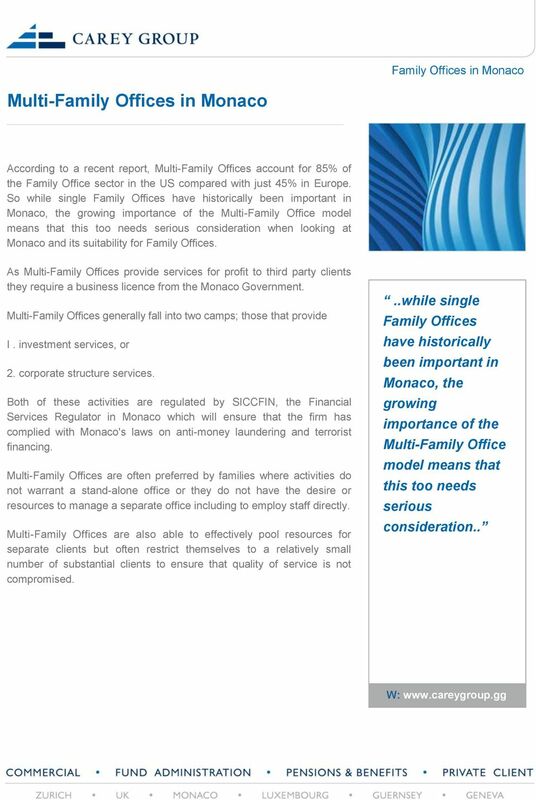 So while single Family Offices have historically been important in Monaco, the growing importance of the Multi-Family Office model means that this too needs serious consideration when looking at Monaco and its suitability for Family Offices. As Multi-Family Offices provide services for profit to third party clients they require a business licence from the Monaco Government. Multi-Family Offices generally fall into two camps; those that provide I. investment services, or 2. corporate structure services. Both of these activities are regulated by SICCFIN, the Financial Services Regulator in Monaco which will ensure that the firm has complied with Monaco's laws on anti-money laundering and terrorist financing. Multi-Family Offices are often preferred by families where activities do not warrant a stand-alone office or they do not have the desire or resources to manage a separate office including to employ staff directly. Multi-Family Offices are also able to effectively pool resources for separate clients but often restrict themselves to a relatively small number of substantial clients to ensure that quality of service is not compromised...while single Family Offices have historically been important in Monaco, the growing importance of the Multi-Family Office model means that this too needs serious consideration..
6 Succession planning & taxes in Monaco Family succession planning It is all very well setting up a Monegasque entity but the next stage is to consider who or what will own it. The family and its advisers will consider issues such as succession planning and asset protection, whether the entity holds assets in Monaco, and ensuring that any risks are managed. Monaco is a civil law jurisdiction with forced heirship rules. Monaco situs assets will therefore be subject to Monaco's succession laws and inheritance (and gift) taxes. However, for certain residents who are nationals of countries that recognise trusts, it is possible to use Monaco's Law 214 enabling them to apply the laws of succession in the country of their nationality. Trust, foundation and corporate structures are also used and individuals and families may, if they can, set up both trust and Law 214 structures to plan for succession and to protect assets. Taxes in Monaco There are no personal income, capital gain or wealth taxes in Monaco. However, there are inheritance and gift taxes based on the relationship of the deceased to the recipient. These apply to Monaco situs assets. If the family sets up a commercial entity, these activities are taxable if more than 25% of the turnover derives from outside of Monaco. Profits are generally mitigated to reduce effective tax rates. 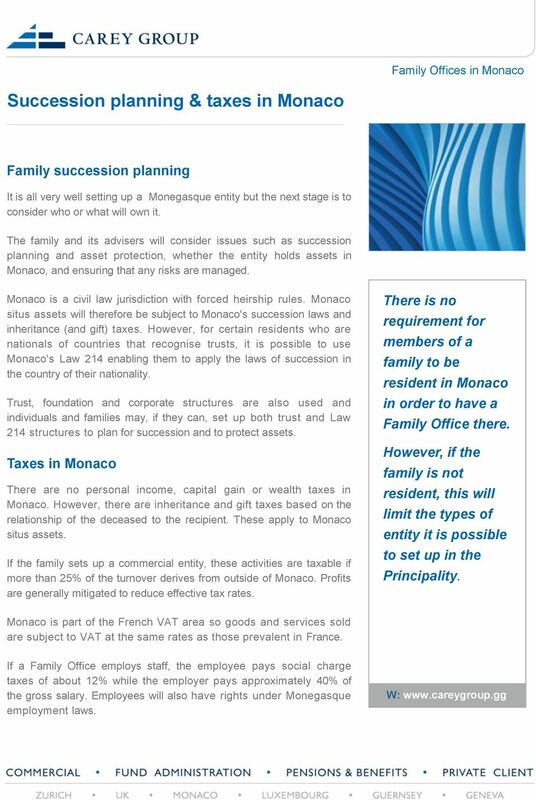 There is no requirement for members of a family to be resident in Monaco in order to have a Family Office there. However, if the family is not resident, this will limit the types of entity it is possible to set up in the Principality. Monaco is part of the French VAT area so goods and services sold are subject to VAT at the same rates as those prevalent in France. If a Family Office employs staff, the employee pays social charge taxes of about 12% while the employer pays approximately 40% of the gross salary. Employees will also have rights under Monegasque employment laws. 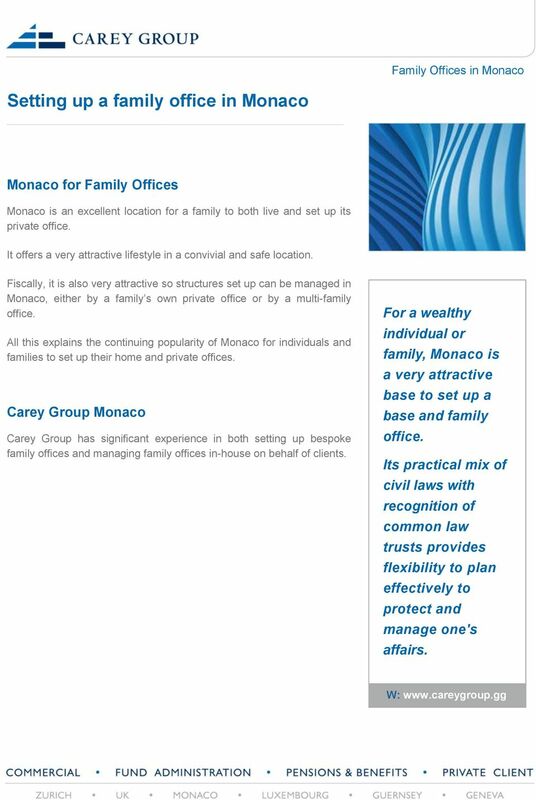 7 Setting up a family office in Monaco Monaco for Family Offices Monaco is an excellent location for a family to both live and set up its private office. It offers a very attractive lifestyle in a convivial and safe location. Fiscally, it is also very attractive so structures set up can be managed in Monaco, either by a family s own private office or by a multi-family office. All this explains the continuing popularity of Monaco for individuals and families to set up their home and private offices. Carey Group Monaco Carey Group has significant experience in both setting up bespoke family offices and managing family offices in-house on behalf of clients. For a wealthy individual or family, Monaco is a very attractive base to set up a base and family office. Its practical mix of civil laws with recognition of common law trusts provides flexibility to plan effectively to protect and manage one's affairs. 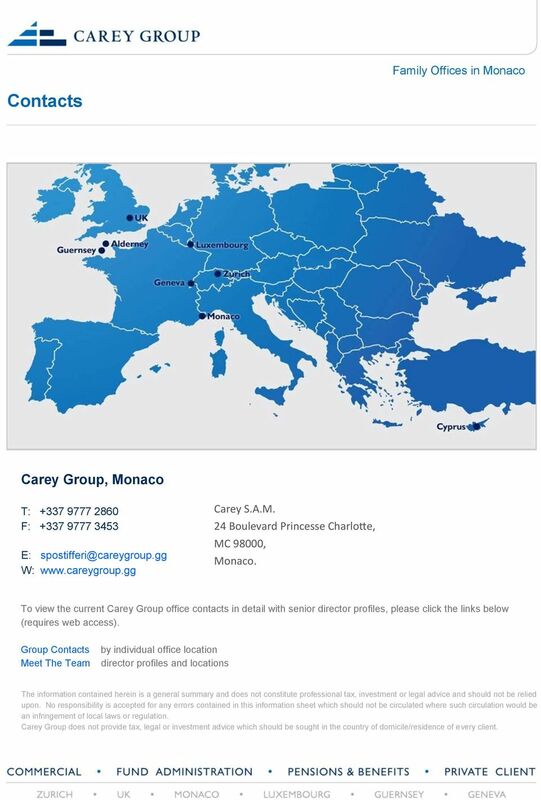 10 Contacts Carey Group, Monaco T: F: E: Carey S.A.M. 24 Boulevard Princesse Charlotte, MC 98000, Monaco. To view the current Carey Group office contacts in detail with senior director profiles, please click the links below (requires web access). Group Contacts Meet The Team by individual office location director profiles and locations The information contained herein is a general summary and does not constitute professional tax, investment or legal advice and should not be relied upon. No responsibility is accepted for any errors contained in this information sheet which should not be circulated where such circulation would be an infringement of local laws or regulation. Carey Group does not provide tax, legal or investment advice which should be sought in the country of domicile/residence of every client. 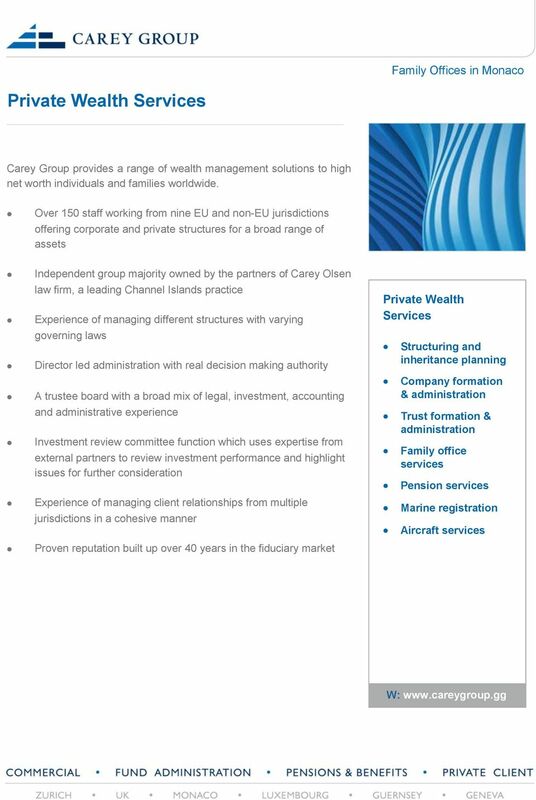 Carey Group l Establishing a Family Office Why a Family Office A Family Office administers a family s wealth in a private, efficient and professional environment enabling control to remain with the family. Jersey. Establishing an Investment Management Business in Jersey. www.walkersglobal.com 2546557.6. A trusted guide, counsel and expert for the things that matter over a lifetime. The Expatriate Financial Guide to Spain Spanish Tax Facts Introduction Tax Year Assessment Basis Taxation in Spain occurs at a national level and at a regional ( Autonomous Community ) or municipal level. Welcome to this session on Professional Trustees. My name is Emma Rice and I am a Tax and Technical Support Consultant in Business Development. KEY PERSON PROTECTION TECHNICAL GUIDE YOUR GUIDE TO KEY PERSON PROTECTION. KEY PERSON PROTECTION TECHNICAL GUIDE YOUR GUIDE TO KEY PERSON PROTECTION. 2 KEY PERSON PROTECTION TECHNICAL GUIDE CONTENTS INTRODUCTION YOUR GUIDE TO KEY PERSON PROTECTION WHAT ARE THE TAXATION EFFECTS? The EU Succession Regulation (Brussels IV) and Conflicts of Law Anna Steward. _ EN Wealth Planning Solutions Together for you Wealth Planning Solutions MANAGEMENT OF YOUR WEALTH TODAY Today the management of your wealth is not limited to the management of your assets in the bank.